Associate Professor Dr. Krisadawan Hongladarom is an expert on Tibet, having authored numerous articles, papers, monographs and books. Also, her research on Tibetan Linguistics and the Anthropology of Tibet has been sponsored by numerous distinguished foundations. Her book At Earth Dust, describes her pilgrimage of prostration in Tibet. 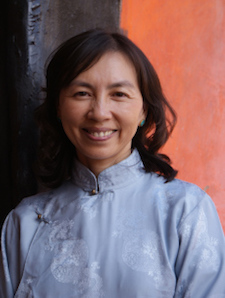 Five months after her pilgrimage she resigned from her prestigious academic career at Thailand’s leading university, Chulalongkorn University, to dedicate the rest of her life to spiritual practice. Now, Dr. Krisadawan is President of the Thousand Stars Foundation, which was established in 2004. It aims to promote the ancient wisdom and culture of Tibet. She is introducing Vajrayana Buddhism to Thailand, and has organized 25 academic seminars and lectures, as well as, 10 empowerment rituals performed by lamas and rinpoches from Tibet. Dr. Krisadawan also supports the education of Tibetan Buddhist nuns. In the past 10 years, she has been in and out of Tibet over 40 times. Dr. Krisadawan’s next project is building a Great Stupa to Tara, the female Bodhisattva, on 10.5 hectacres of land in Hua Hin, Thailand. Here she is creating the Khadiravana Retreat Center. Dr. Krisadawan is pioneering the introduction of Vajrayana Buddhism in Thailand.